Cole Lange received his first bike when he was 10 years old. Nine years later, he’s a national champion. Lange, who calls Shamong his hometown, won the 2014 National A Open Enduro Championship in Indiana at the 61st Mud Dobbers National Enduro on Sept. 14. Enduro is a particularly punishing version of motorcycle racing taking riders through a variety of relentless terrain, including dense forests, rock quarries, sand pits, riverbeds and wetlands. After crisscrossing the country since March 2, competing in 10 races in nine different states, Lange led the national field over the course of the series besting hundreds of other A Open riders from all over the United States and Canada. It is only Lange’s second year riding at the national level but the result was not a surprise for him. Lange fought through injuries, mechanical issues and exhaustion all year. He traveled thousands of miles to South Carolina, Tennessee, Michigan, Colorado, Texas, Missouri, Virginia, Pennsylvania and Indiana. Though if you ask Lange, the travel is one of the best parts of the experience. “I flew to Colorado and had my bike shipped but all the other races I drove to. The closest race is more than six hours away so it’s a lot of time driving in a motorhome with my friends. It’s a lot of fun,” Lange said. In the last few races, it was a battle with at least four other riders from Texas, Idaho, Illinois and Georgia. August in South Carolina brought searing 95-degree heat and humidity resulting in heat exhaustion, which almost left Lange unable to walk let alone finish. With the championship on the line, he persevered and exhibited gutsy determination to finish strong at the 62nd Little Brown Jug National Enduro. His series championship victory on Sept. 14 in Indiana was uncertain until crossing the finish line. Lange needed a top 26 finish to win the championship, and he left little doubt as he came out of the gate fast winning two of the first three sections and lead the race most of the day. “It was an awesome experience, that race. The whole season was really great,” Lange said. 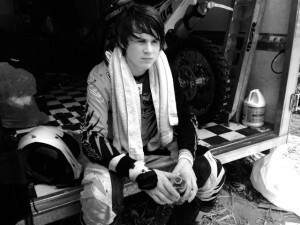 Lange began racing motorcycles when his dad bought him his first bike nine years ago. His love of enduro was born after competing in a hare scramble, which is a type of enduro race that has laps rather than stages. That love was fostered right at home, Lange said, as the Pinelands area has a passion for the sport. With one national championship already under his belt, Lange will compete next year at the AA Expert Class. “It’ll be a whole new level of competition which is exciting for me,” Lange said.